The island of Guam is a United States territory set in the Western Pacific Ocean, due east of the Philippines. At 209 square miles Guam is the largest island in Micronesia but is still just the 32nd-largest island under U.S. control. Its inhabitants total a little less than 175,000. Accordingly, Guam doesn't exactly garner a whole lot of attention stateside when it comes to the Olympics: NBC has elected to go to commercial during Guam's opening ceremonies procession in each of the past two Olympics. But count the University of Portland as at least one corner of the continental U.S. that hopes the Guam flag does get some airtime during the opening ceremonies of the 2008 Olympic Games on Friday in Beijing. More specifically, members of Portland's cross country and track and field teams hope the cameras somehow find the smiling face of their beloved former teammate Derek Mandell. A native of Tamuning, Guam, Mandell came to the U.S. in the fall of 2004 as a freshman and, like his older brother Desmond (Class of '05), enrolled at UP. Before he even took a class, Mandell tried out for Portland's cross country team. Pilots coach Rob Conner saw enough in Mandell to allow him to join as a walk-on. "I started running when I was about six years old by attending the local 5K fun runs on weekends," Mandell, now 21, recalls. "I always enjoyed it but never did it competitively until middle school [at age 11]. I just tried my luck at making the [Portland] team during orientation week of freshman year, and luckily Conner let me join." It wasn't long after Mandell made the Pilots team that Conner became aware of the walk-on's Olympic dreams. At the time such a notion may have seemed far-fetched: Mandell was one of Portland's weaker runners. But he was also fiercely determined. After making noticeable strides during his first season of cross country, Mandell was allowed to run track in the spring as well. He ran primarily in the 1500 and periodically in the 800 and 5,000. Steadily improving with each season, Mandell shaved 23 seconds off his 1500 time throughout his four years as a varsity letterman and more than six seconds off his 800 time despite not running it nearly as often. In cross country, Mandell lowered his 5K time from high school by more than a minute. Although he was never the fastest runner on the UP team, by the time he graduated this past May, Mandell had emerged as a solid contributor in both the fall and spring. "When he arrived here he really wasn't good enough," Conner states plainly. "[But] he came a very long way, actually,"
All the way to Beijing, in fact. Making it known that he "always wanted to represent Guam at the Olympics," Mandell realized it could become a reality a few years ago. In addition to competing for two varsity teams at Portland and navigating through a typically rigorous college course load, Mandell began entering qualifying events in Micronesia. Guam doesn't send many athletes to the Olympics, but Mandell longed to be one of them. "Because Guam is a member of the International Olympic Committee and has never had an athlete in track and field meet the Olympics B-Standard qualifications, we are allowed to send one male and one female in the events from the 100-[meter dash] to the 1500," he explains. "I just so happened to be that athlete." Mandell received the good news back in April. "It's something he's had on his agenda the last four years since arriving [at Portland, but] there's been a buzz on our team the whole year as soon as guys found out about the opportunity," Conner says. "Derek's a quiet guy and doesn't like to draw attention to himself. So one day we're just walking to practice and he says, 'Coach, I got the call.' The team was very excited for him." Although the 1500 is Mandell's best race, some of the dignitaries on Guam's Olympic committee preferred that he run the 800 in Beijing -- in part because of the allegedly poor air conditions. Reluctant to make the switch at first, Mandell ultimately agreed, though having been in Beijing for more than a week he reports that "the air isn't all that bad here." After finishing third in the 800 at an event in Micronesia last month, however, Mandell now feels that he can "produce a better 800 time than 1500 time in these Games." Still, Mandell will be under no illusions when the gun sounds on Aug. 20. His personal best in the 800 is 1:59.1. By comparison, a 1:45 is required just to make the U.S. team. He knows he stands little chance. But in Mandell's mind winning couldn't be more irrelevant. "I know it sounds like a free and easy route to the Olympics from an outsider's perspective, but the track and field program on Guam is still developing and learning," he explains. "Even when I found out I would represent the island, I wanted to train even harder because if Guam was going to send me, I wanted to make sure I did the best I could to prepare myself for such a competition. … I expect to run my best and hopefully hit a personal best. Because of my unqualified status I need to focus on running my own race and not worry about those ahead of me." Like all his former UP teammates -- including fellow Guam native Johnson Lee -- Mandell's parents and two brothers will be glued to the TV on Aug. 20 along with the rest of the island, where the motto is "Where America's Day Begins." Though his family is unable to attend, Mandell's aunt is the Guam team's physical therapist and will be there to cheer him on. The cheering in Portland will be as loud as anywhere. 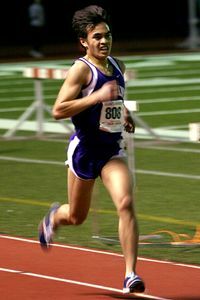 Conner asserts that there is "no resentment" among any of Mandell's faster teammates at Portland (two of whom made it to the Olympic trials in the 10,000). Conner himself speaks of Mandell like a proud father. "I think this is the ultimate athletic opportunity for him. I told him, 'You're gonna have every top athlete in the world next to you.' Guam will have a very small contingent, and we're a small school -- one of the smallest in Division I, with about 3,000 students. This is the ultimate little-guy-against-the-big-boys story." Mandell sees his opportunity as having even greater implications. "I always wanted to wear the word 'Guam' across my chest in the Olympics and now I am fulfilling a childhood dream," he says. "I'm still a little nervous knowing that everyone is going to be watching, but I'm hoping to inspire the youth of Guam to take up the sport so that [a runner from] Guam [may] one day be at the Olympics as a fully-qualified athlete." Wow. Amazing story. How awesome must it feel for Derek to represent the island he grew up on? He's already doing a great job. 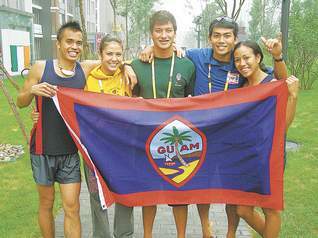 Picture of Derek and the rest of the Guam Olympic Team in Bejing! Congrats to Derek! A personal best at the Olympics... that's awesome! Hopefully the heat will be televised tonight...? You may be "experienced" I wont use the O- word, but don't let anyone tell you that you aren't still sharp. Ha ha... I'm going to have DaTruRochin's back here. In the track world, the term "PR" is definitely used as a verb all the time, as in "Usein Bolt PRed in the 200 today". I see the difference between that and saying LOL and OMG and stuff like that. Oh yes... I can paint in all kinds of shades of gray! No but seriously my hats off to Derek, huge accomplishment, way to do the Pilot Nation proud!!! I'm starting a rumor that DTR and SH are the same person. Have you ever noticed how they seamlessly stick up for each other? Fine DTR/SH vs 54/Geez.... Caps, Pong and dance off if necessary... Cahoot that!! I heard Bolt WRed in the 200 as well. I'm surprised Michael Johnson's record from Atlanta '96 still stood. I just read the story on the official Olympic site. WOW. You are correct sir. BTW, how do you get CBC up there? Is it part of the cable package? Or does it come over the air from BC? Oh - and doing the Chicken Dance with Dr. C doesn't count in competitive dancing. Besides, I think there's a substance test. Are you sure you want to be put through that humiliation? Oh and geez... I was born for that kind of humiliation, I feed on it! !